The following is an excerpt from Josh Hillis and Dan John’s book, Fat Loss Happens on Monday. When it comes to making food work for fat loss, there are only three variables: quantity, quality, and ratios. That means quantity of food, quality of food, and the ratio of macronutrients, like proteins, carbohydrates, fat, and alcohol. When we’re dealing with quantity, we’ll find a lot of diets based on that. These are any type of diets that use points, blocks, or counting calories. This all boils down to different ways of measuring quantity. Another way people measure quantity is portion size, like the original Body for Life diet where a portion of carbohydrates or a portion of protein is the size of the palm of a hand. This is just another way of measuring quantity. Right now, it’s cool to say quantity doesn’t matter or counting calories doesn’t work. While this is a slick marketing technique, it’s just not the truth. I’ll give you a quick story. I used to do Brazilian jiu jitsu. I often ran into people who were professional fighters. Things really hit home for me when I was hanging out with Marcus, a guy who fought at different weight classes. Marcus was a built dude. He was about 8% bodyfat, which is lean. He was about 8% when he fought at one weight class, and he could fight at a weight class 15 pounds heavier and still be about 8% bodyfat. He was lean in three different weight classes. I asked him about his diet and how he changed weight classes. The quality of his diet was always the same. He always ate about the same foods. The only difference between one weight class and another was the quantity of food he ate. Don’t believe anyone who tells you quantity doesn’t matter. Of course, quantity matters. In fact, I would argue that the only thing that determines your scale weight is the quantity of food you eat. If you’ve got a highlighter, highlight this: Quantity equals scale weight. Any way you measure quantity, whether it’s calories, points or palm-of-the-hand portion size, that’s what’s going to determine your scale weight. For our purposes, we’re going to use calories. Look, I know calories aren’t a perfect measurement, but they’re the best measurement we have, and the most effective way to track quantity for fat loss. A note about quantity: They’ve done numerous studies proving that the people who have the hardest time losing weight are the same people who have the hardest time judging and journaling accurate quantity. Said another way, if the scale isn’t moving, you should literally weigh and measure your food to recalibrate yourself to how much you’re eating. The next issue is quality. Now, quality works on multiple levels. When people are eating fast food, they don’t need to worry about whether their eggs are free-range. They need to worry about eating less fast food. There are a lot of different diets that look at quality. Usually, they recommend a certain level of quality and that’s the level of quality you’re told to eat. You need to move through levels of quality. If you’re eating Ding Dongs and Ho Hos every day, that’s the thing to handle. You don’t need to worry about not eating a turkey sandwich because it isn’t what a caveman would eat; you just need to stop eating Ding Dongs. As your levels of quality improve, the quantity is going to become less important. This is the concept behind a lot of diets with the idea that you don’t need to worry about quantity. It’s one of those things where as the quality improves, you’re going to get leaner. I’m going to simplify things a lot. The reality is, quality equals bodyfat percentage. Whatever the scale weight, your ratio of muscle to fat—how lean you look, how tight you look, how toned you look—is your bodyfat percentage. Regardless of what the scale says—Higher bodyfat percentage means more jiggling. Lower bodyfat percentage means more lean and tight. Quality is something I coach incrementally. There are different levels to work through, and you don’t have the same concerns at one level that you have at the next. Impacting the quality of food you’re eating is so powerful, people have created diets to focus entirely on that. The quality of food you’re eating directly impacts your leanness and your tightness or your ratio of muscle to fat. It’s one of those things where whatever your scale weight, your ratio of muscle to fat at that scale weight is going to be impacted by the quality. It really is this simple: Food quality equals body-fat percentage. As you look at quantity and quality, these both matter a lot. They just affect different things. If your real issue is scale weight, you have to take a look at the quantity. If your real issue is you’re not as lean and tight and toned as you want, you have to take a look at quality. If your issue is both, you have to take a look at both quantity and quality. The last of the three variables we look at in terms of food is ratios.  is is another area where you’ll see diets entirely based on ratios of protein, carbohydrates, and fat. For example, The Zone Diet equally balances protein, carbohydrates, and fat. Atkins and ketogenic dieters eat no carbohydrates—just protein and fat. And in the 1980s, it was all about low fat. These are all ratio diets. Usually, when they work it’s actually because altering the ratios or providing some kind of rules generally lowers the quantity of calories. In terms of ratios of proteins, carbohydrate, and fats I don’t give people a specific rule. In fact, when I worked at a large gym, we used to survey people to give them a macronutrient ratio ‘type.’ We found both ‘carb type’ and ‘fat type’ people. Basically, what that came down to was some people feel full with more fat. Do you stay full and satisfied after a meal that’s mostly carbs? Do you stay full and satisfied after a meal that’s mostly fat? Do you stay full and satisfied after a meal that’s mostly balanced? In terms of protein, almost everyone feels more full with more protein in the diet. Right now, with protein and fat being all the rage, you might assume that everyone feels more full and gets better results with more fat. I have actually had clients who were ‘carb types’ and felt more full with a higher carbohydrate diet. We would rock it. I helped guys get down to 10% bodyfat and women down to 18% and 19% bodyfat on fairly high carbohydrate diets, as long as they were eating good-quality carbohydrates. This means they were getting all of their carbohydrates from fruits, vegetables, brown rice, and quinoa. It’s totally workable. I don’t type people by survey anymore. Now we just take a look at the food journal. We take a look at when they were hungry and after which meals. It’s usually pretty simple. We see things like, here I had more carbohydrates and I felt more full, or here I had more carbohydrates and I was starving an hour later. Things are usually pretty obvious if you look at your food journal, assuming you keep good notes. There’s also a fourth variable, which is timing. A lot of people get into food timing as something they think they should focus on. But timing really isn’t an issue. It’s one of those things where people talk about what you need to eat or not eat at night or how you need to split food up into six small meals. This is not something that’s been an issue for my clients, and it’s not something we’re going to work on. It’s one of those things where if we get the quantity and the quality correct, you’re set. Most of the timing protocols are unnecessarily complicated. One of my least favorite concepts is six small meals a day. Quantity equals your scale weight. Quality equals your leanness and tightness. What we should talk about next is context; it’s a mindset thing. Context is not going to change anything we talked about before. It doesn’t change what you do. However, by adding new context to it, it changes the way you do it. It might change the intensity you have or the level of commitment you apply. Here’s how this works. My specialty is helping people lose stubborn fat. The biggest mistake you can make in losing stubborn fat is to buy into the idea that fat can be stubborn. In fact, there’s no such thing as stubborn fat. Fat is actually the opposite of stubborn. If you think about it from a physiological perspective, fat needs to be maintained. If you don’t constantly feed fat, you’ll lose it. Fat is like a stray dog. If you keep feeding it, it will stick around forever. If you stop feeding it, it immediately goes away. One of the things you have to latch onto is that anything making fat appear to be stubborn is a mistake in terms of quantity, quality, or ratio. Actually, it’s just quantity or quality. There is no stubborn fat. There’s usually an issue with preparation or with the way you’re tracking such that you’re making an error in quality or quantity.  at’s why you still have the fat. Once you rectify the issue of getting quality and quantity correct, fat can no longer be maintained and you’ll lose it. This is really the basis for the way I coach everyone. It’s in view of that context that I make every recommendation. It may seem like a simple or a small thing. But once you get it, everything becomes very clear. It really boils down to the fact that the quality of food equals how lean and tight you are, and quantity of food equals scale weight. Anything that’s stubborn inside either of these is either too much quantity or too little quality If you stop maintaining the excess quantity and stop maintaining the lack of quality, you’ll lose fat. Here’s another way to look at it. If you have more fat than you want, you need to look at what you’re doing to maintain the fat and stop doing that.  That’s really all there is to it. It’s exactly that simple and easy. Actually, ‘easy’ is probably not the right word, but it is that simple and it is that clear. If you really use this as the context for all of these tools and all of the strategies you’ve heard so far, you’ll have a new access to fat loss that you didn’t have before. 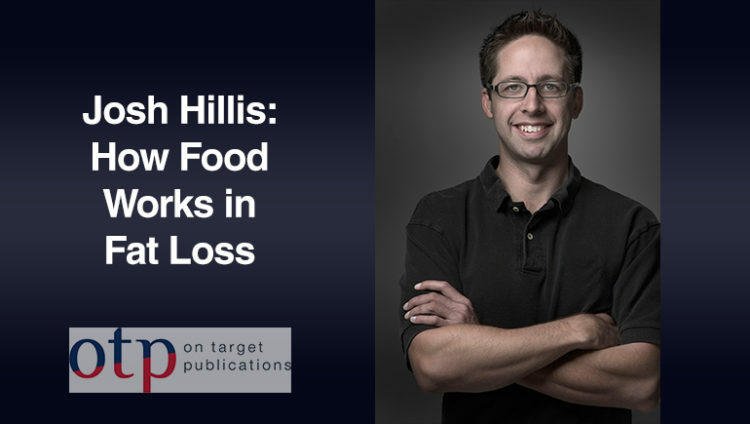 That was an excerpt from Josh Hillis and Dan John’s book, Fat Loss Happens on Monday. Click that link for more details and other excerpts. Subscribe below and we'll send great articles to your email box. Includes FREE access to our OTP Vault of material from experts in the field. Subscribe and we'll send great articles to your email box. Includes FREE access to our OTP Vault of material from experts in the field.